I received the book Every Child a Super Reader from Scholastic a few weeks ago. I haven't had time to read it cover to cover yet but have spent lots of time flipping through it. 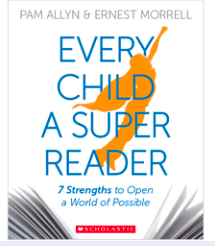 Ernest Morrell and Pam Allyn are so smart about literacy and children. They are committed to making sure ALL children are super readers and have the experiences they need for this to happen. I was able to listen to the Podcast, "Every Child a Super Reader" that they did a while ago and their commitment to children and their beliefs about what all children deserve when it comes to literacy were so powerful. I am anxious to dig into more of the book. We, as a country, have become so focused on skills and test scores and reading levels, that we have somehow lost sight of things that are really most important in helping kids live their lives as readers. Ernest and Pam talk about agency and choice and the limits of levels. They say, "Learning to read is typically defined as learning to control a specific set of skills. And while it's certainly true that children must learn to orchestrate a complex set of strategic actions that enable comprehension and decoding, it's equally true that learning to read is a social-cultural event. In other words, learning to read is more than simple skill building." They share the "7 Strengths Model" as important as children build their reader identities through childhood. There is a lot of fresh thinking as we would expect from these authors. They move us beyond our thinking about what it means to become a reader and layers all that we know into ideas that help us see what is possible for every reader. They take a look at access, schools, families, assessment and more. It seems like this is another piece of Scholastic's commitment that started with Open a World of Possible. This year, Pam and Ernest will be part of many of the Scholastic Reading Summits. I went to one last year and it was an incredible and inspiring day. I am hoping to get a chance to make it to one of the summits again this year. I am looking forward to spending more time with their book and hearing their message in person at one of the summits. I am definitely looking forward to spending more time with this book and thinking about the ideas that Pam Allyn and Ernest Morrell share. I agree, every child is a Super Reader. This is not a one size fits all notion either. Every child is a Super Reader in their own way. This is not measured by test scores, norm-referenced, criterion referenced, or any state mandated material. This is measured by the individual progress made by the student, the confidence obtained by that student, and the pride in which they gain. This is what makes a Super Reader. This is also something that may take a shorter amount of time, or something that takes years to master. At either pace, teachers are there to guide the way for those upcoming Super Readers! I wholeheartedly agree that our country has become far too focused on test scores, but I'd like to take it a step further: I believe our country is also far too focused on pushing developmental milestones on children instead of allowing them to reach them at their own pace. I think if we focused less on test scores and pushing these developmental milestones and more on fostering a love of literacy, we'll see more students become Super Readers.